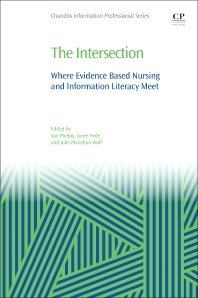 The Intersection: Where Evidence Based Nursing and Information Literacy Meet describes how the Association of College and Research Libraries (ACRL) Framework and Information literacy Competency Standards for Nursing mesh with nursing essentials, thus speaking to the information needs of nurses, nurse educators, and librarians who support worldwide nursing programs. In order to find the best evidence from studies, students and practicing nurses must be proficient in the entire range of information literacy skills. Though the references for this document are from U.S. organizations, they are applicable to nursing audiences across the globe. Librarians in healthcare including hospital librarians, healthcare librarians, nursing librarians; nurse educators; researchers and postgraduate students in library and information science. Sue F. Phelps is the Health Sciences and Outreach Services Librarian at the WSU Vancouver Library. She teaches an online course in Finding Information for Research and provides research assistance for students in the Washington State University College of Nursing. She is passionate about equal access to educational resources for all students and for building a culture of equity on the Vancouver campus. Loree Hyde is the Regional Manager of kpLibraries in the Northwest Region. She has a strong focus on evidence based health care and values being part of the clinical decision making process. Loree provides mediated searching services for health professionals, as well information literacy instruction, and serves as a founding member of the Kaiser Permanente NW Evidence Based Practice and Research Council. Julie Planchon Wolf is the Research & Instruction/Nursing and Health Studies Librarian at the University of Washington Bothell where she provides online and classroom instruction, and assists faculty in designing assignments. She is one of the co-authors of the Information Literacy Competency Standards for Nursing, located online at http://www.ala.org/acrl/standards/nursing. See more about her online at http://library.uwb.edu/staff/wolf/wolf.html.